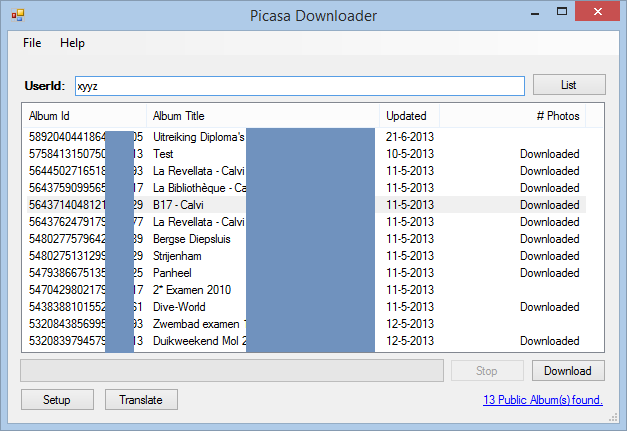 This application lets you download multiple Picasa web albums of a selected Picasa user with only a few clicks and without Picasa being installed. If you like this tool, leave me a note, rate this project or write a review or Donate to PicasaDownloader. If you've encountered problems, leave a (detailed) issue in the Issue Tracker. Right-Click an album for an album preview. 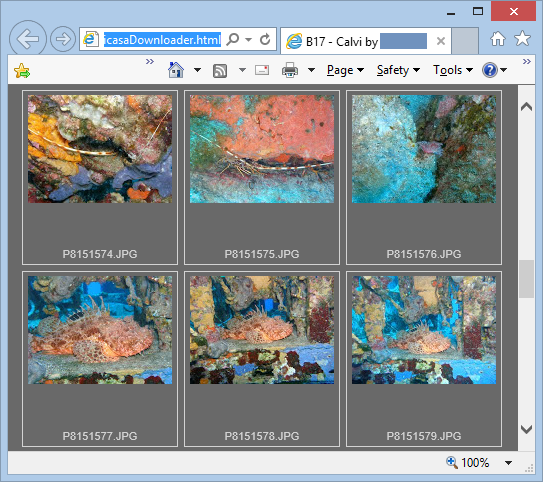 This preview can be stored on disk and contains direct links to the thumbnails. Ctrl-Click the download button to download at images at the maximum resolution. Left-Click the album count (bottom right) to open a download directory. Right-Click the album count (bottom right) to select a download directory. PicasaDownloader can access more then 10k albums of a single user. Paste or drop a link of a shared album containing an authkey in the userid edit box. I'm NOT a big fan of forking and specifically creating repository copies at GitHub (as the sources end-up all over the place and in various states of decay). So please do not fork. If you want to contribute, please post or mail changes for review. Fixed preview for shared albums. Fixed one more DateTime typecast. Changes PicasaEntry and PicasaAlbumEntry to a class. Added support for shared albums where the url contains a authkey query parameter. These url's can be pasted (or dropped) in the userid edit field. where the authuser and feat parameters are ignored.